- Faneuil Hall is located in the east of the Commonwealth, and in the northeast of the more heavily citied district of Boston. You’re most likely to find the place when you’re on the quest Road to Freedom, looking for the Railroad, as the Hall is one of the places you need to stop along the Freedom Trail. 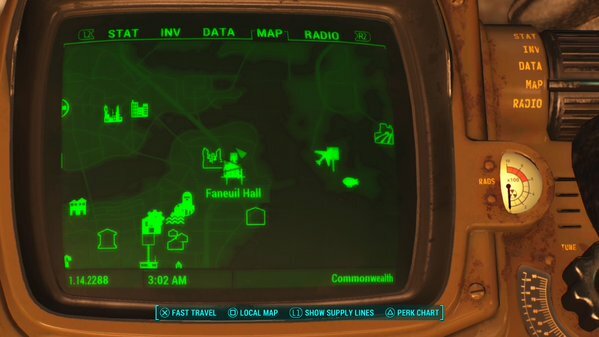 You may also get directed here by Knight Rhys during a Cleansing the Commonwealth mission. - Faneuil Hall is owned by Super Mutants, and you’ll run into a hearty contingent of the bastards on the west and east ends. You’ll have a slightly easier time going after the guys to the east first, as one is a Suicider who can give you a rather rough time if he manages to slip past his comrades and get to you. Shoot his arm and he should take out at least one other Super Mutant in the resulting explosion. - If you enter Fanueil Hall from the west you’ll emerge in a vending area patrolled by several Super Mutants. It’s not too difficult to clear this area, regardless of your approach, as there’s tons of cover to use. (Though the darkness can be a pain.) A pair of Protectrons near the western entrance can be activated to raised a ruckus, as well. There are plenty of Super Mutants on the upper floors of the Hall, but they won’t come down to attack even if you make noise, save perhaps for a Mutant Hound. You can also get here from the eastern entrance, but you’ll find a main set of stairs leading to the next floor as well. - Once you’ve cleared out the ground floor, have a look around. There are plenty of items to grab, among them lots of Pre-War Money from the cash registers. If you check the southeastern office you can find a manager’s terminal; this will allow you to activate a Protectron to roam about and cause trouble on the next floor. There’s a Faneuil Hall Cashier’s Key on the cabinets behind the terminal, and you can use this to unlock the cashier booth in the northwest. There’s a safe back here containing goodies. An elevator near the manager’s office will take you to the third floor; be careful of a Super Mutant right outside the elevator. - Climb to the second floor. There are a few side doors near the stairs which will get you into battles with more Super Mutants, and if you’re not careful in the bathroom you may trigger grenade traps opening the stalls. The central room with the balconies is guarded by a larger contingent of Super Mutants, but there’s plenty of cover, so a firefight shouldn’t be horrible. Stay under the balconies when possible to avoid being sniped from above. - This clears out Faneuil Hall. There’s a Live & Love magazine in the larger room’s small antechamber, beside the couch, and if you check the rear of the Master’s room you’ll find a cache of ammo. There’s also a ladder in this rear room that leads to the roof of the Hall, though you won’t find much up here beside the opportunity to fast travel… or to perform some rather fruitless roof hopping. There's a mission "Treasure of Jamaica Plain" on a magazine rack, cant remember what floor. Looks like a piece of paper to pick up.